Drivers arrested for DUI in Los Angeles usually have a blood alcohol content of 0.08 or higher. But there are times when a DUI suspect’s BAC measures much higher—so high that you wonder how they ever managed to even get behind the wheel of a vehicle, much less drive it. In Henrico County, Virginia, 44-year-old Angela Gittings faces DUI charges after she hit several vehicles outside an area high school. Police measured her blood alcohol content at 0.38, more than four times the legal limit. Gittings was also driving without a license; the DMV had revoked it because of previous DUIs. According the National Institute on Alcohol Abuse and Alcoholism, a BAC of 0.31 to 0.45 poses a “significant risk of death in most drinkers due to suppression of vital life functions.” People with this level of alcohol may lose consciousness and/or suffer from life-threatening alcohol poisoning. 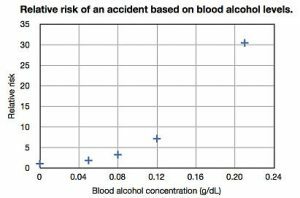 The NIAAA also states that a BAC reading of 0.16 to 0.30 significantly impair a person’s speech, memory, coordination, attention, reaction time and balance. It also has a very negative impact on a person’s driving-related skills, judgment and decision making. That may be why Glenn Krisak, 46, drove his Pontiac Grand Prix into a restricted area of the New York State fairgrounds in Syracuse on September 4th. Fortunately no one was injured despite the fact that many people were walking around in the area. Police measured Krisak’s BAC at 0.30, and then charged him with two felonies: aggravated DWI and first degree aggravated unlicensed operation of a motor vehicle. He also faces traffic violations that include drinking alcohol in a motor vehicle on a highway and failure to obey a traffic control device. California Vehicle Codes 23578, 23538 and 23575 provide for additional penalties for drivers with high BACs. People arrested with a BAC of .20 or more can lose their licenses for 10 months; if they’re a first offender, the court may order them to install ignition interlock devices on their vehicles for up to three years.